Web hosting by 1&1 What is Steadicam®? Invented in 1976 by Garrett Brown, the Steadicam was created as a specialist support to allow a camera to be carried with freely without the shakes and wobble normally associated with a handheld camera. 30 years later, the Steadicam is still the most versatile camera support in existence. It allows the operator total freedom of movement as desired for unlimited shots in most any location while keeping the camera perfectly stable and smooth. Used in most feature films today, as well as many TV programs from drama and documentary to music videos and events like concerts and sports, the Steadicam is a perfect tool for camera support and movement. Though very complicated, the Steadicam works on very simple principles. The camera is mounted on a "sled" which has a monitor and a battery mounted on the opposite end of a post which act as counter weights and pull the center of gravity of the system out of the camera to a point on the post where it can be controlled. There is a gimbal on the post just above the balance point that allows total angular isolation and freedom of movement of the camera while providing precise control. 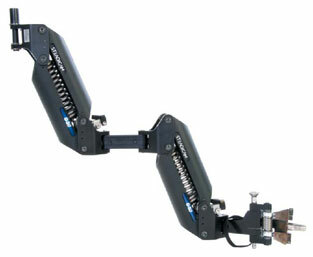 The gimbal supported sled is then connected to the Operator by way of an articulated arm that holds the sled in space while allowing the operator to move freely without affecting the camera. Finally the arm is attached to a vest which spreads the weight of the system over the operator's torso. 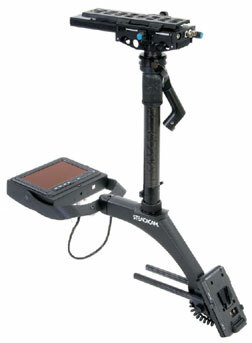 The Steadicam Archer sled with G-50 arm. Steadicam Archer with EFP vest. - Supports cameras up to 11Kg [23lbs] (Most any TV/video and many film cameras). - 78cm [32"] boom range, with high and low mode options. - 12v onboard power for camera and other accesories with V-mount batteries. - Wireless video link for director's monitor + external 12v accesory power system. - Compact to transport and fast to set up saving time and money. - Breakaway vest allows safe operation in more situations such as on water. - Allows camera to be lowered to within inches of the ground. - Extemly light and compact handheld unit for small cameras (up to 2.5Kg [5.5lbs]). - Allows unsurpassed freedom and mobility with perfect stability. - Perfect for either shot planning and blocking, or DV and HDV production. "Steadicam", "Archer", "Merlin", "Flyer", and "G-50" are registered trademarks of The Tiffen Company.